An AI-program that thinks like someone with autism is being used to develop education tools. The program runs on a a computer on the third floor of the Vanderbilt University Featheringill Hall. It scans geometric patterns, deciding which missing shapes would be most likely to fit in. The program fills in those blanks about as well as a human 17-year-old would, and it’s only getting smarter, thanks to a study of the way certain people on the autism spectrum see the world. 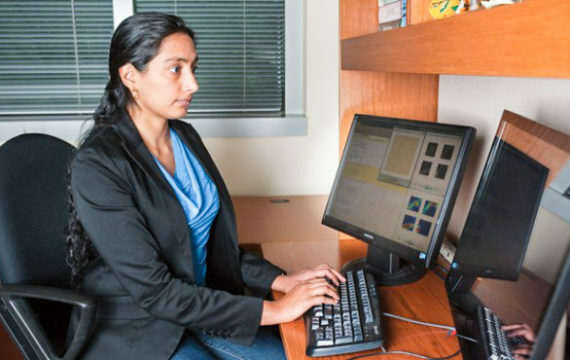 Assistant Professor of Computer Science Maithilee Kunda is responsible for the development of the algorithm behind the AI program. Kunda says she was inspired by the writings of Temple Grandin, a zoologist and one of the most famous persons on the autism spectrum. The assistant professor figured out how to write code that emulates the kinds of image-based thinking that Grandin used to design complicated farm equipment. The result is a form of artificial intelligence that allows researchers to study a model of human cognition, determine how it problem-solves and then tweak it to perform better. For her work on the AI program, Kunda works with a neuropsychologist who studies visual cognition in autism. At Vanderbilt, computer science students in Kunda’s lab are working to turn that system of thinking into code. The lab’s computers are programmed to solve many different types of human cognitive tests, such as the Raven’s Progressive Matrices, an intelligence test developed in 1936 that asks subjects to look at a series of patterns and determine what the missing one would be. The AI is improved by looking at intelligence that isn’t neurotypical. It can draw from a richness of variety in human intelligence, making it more creative and effective. At the same time, researchers are using artificial intelligence to develop educational tools specifically for people with autism.